There's this huge sale right now, but I am too tired to go, which tells you how tired I am. I am seriously seriously seriously burned out. And as much as I would like to take a break just to rehabilitate myself, I can't because there is so much more waiting to be done. I can't pinpoint when exactly it all started, but my work just started ballooning by the second, and this week I found myself so swamped with work I barely have time to breathe. In fact I was so frazzled I often hanged - someone would ask me a question and I would stare at them for ten seconds, blink a couple of times, and after a few more seconds of silence we both realize I am incapable of processing anything at the moment. And what makes it so much more painful is I think, no, I know I'm doing a terrible terrible job right now - there are things I should've checked but I did not, things I should've been on top of that slipped my mind, and reports that I should have turned in but did not have enough time to finish. There is just too much going on and it's been increasingly difficult for me to cope. Anyway, enough of the rant and on to the lighter, more fun side of things. First of all, I realized I should stop buying make-up and skin care. First, because I only have one face, and second, because unlike clothes, I don't have to use different products every single day. I guess the huge make-up collections are more for people who have enough creativity in them to vary their looks everyday, but that's just not me. I'd rather just stick to my staples. 1. 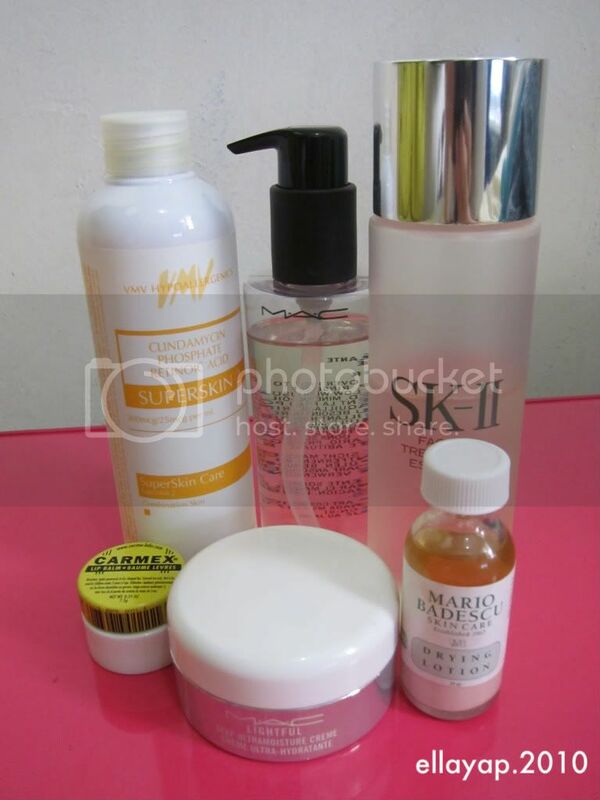 Not in the picture: Shiseido Perfect Whip foaming facial cleanser. Nothing fancy, just your regular facial wash, but it does produce a helluva lot of bubbles. Oh, and MAC Microfine Refinisher which I use whenever I feel like I should exfoliate. 2. MAC Cleansing Oil: I use this to remove my makeup. I've tried Shu Uemura's cleansing oil but I prefer this one (and it's cheaper too). It gets everything off, including waterproof mascara. 3. VMV Superskin Toner: I always go back to this, for some reason. Whenever I try cheating on it I get breakouts. 4. SKII Facial Treatment Essence: I wouldn't say this is a staple, and I hope it's not because it's expensive (I got it on discount courtesy of Anj), and I'm not even sure how it works but I use it anyways. I'm not sure if it's this one or a combination of the things I'm using but my skin is very very well-behaved lately. 5. MAC Lightful Deep Ultramoisture Cream: I think I've rambled about this enough. 6. Mario Badescu Drying Lotion: This is a recent discovery, and it's a godsend for those annoying stress pimples. I usually make things worse because I'm a picker (I know, I know, it's terrible but I can't stop myself), but this flattens them up almost overnight so I'm left with nothing to pick on. 7. Carmex Lip Balm: It tastes terrible, but it works. 8. NARS Sheer Glow Foundation. I love love LOVE this foundation. It doesn't feel heavy, it doesn't cake, and the shade is almost perfect (I'm using Stromboli), it covers pretty damn well, and the finish is not too matte, but not shiny either. I've tried a couple of ways of applying it - beauty blender, sponge, MAC187, foundation brush, kabuki brush - but I find that the best way is to just go ahead and use my fingers. My only beef? No pump. Seriously, NARS people, would it kill you to include a pump? 10. MAC eyeshadow in Cork. I just use this for my brows, so this would probably last me for life. I can't really do eyeshadow with the whole crease-outer V-inner corner-outer corner thing, because my eyelids are weird. 11. Nichido eyeshadow in Bronze Eclair. Dirt cheap, but surprisingly pigmented, and it's the only eyeshadow I can actually use - I just sweep it all over the lid and call it a day (or more appropriately, night). I can't vouch for the other shades from this brand, though, because I have another one (the black one) and it's crap. 12. Aromaleigh silica powder in Peaches and Cream. 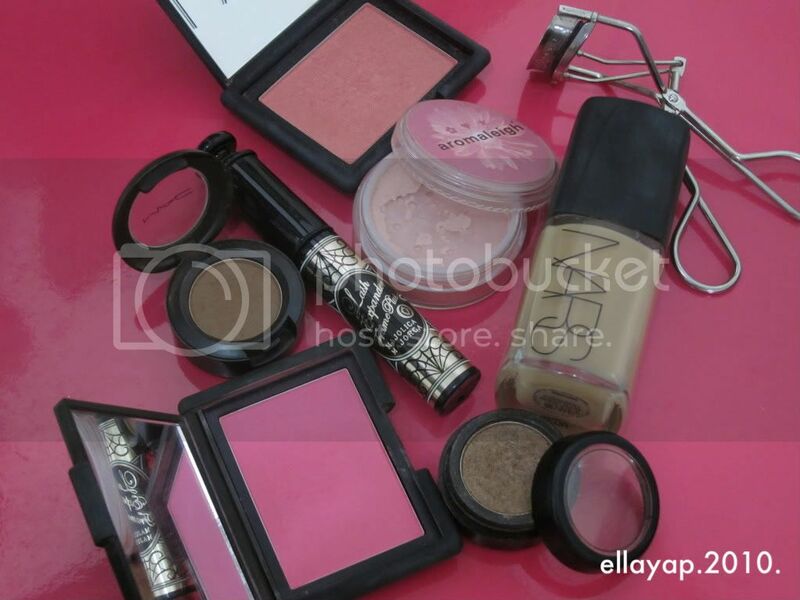 I just recently discovered that it works wonders as a setting powder for the undereye area, so I'm glad I didn't chuck it out together with the rest of my mineral make-up stash. 13. Majolica Majorca Lash Expander Frame Plus Mascara. This is the best mascara ever. There is no better mascara than this. None. 14. Shu Uemura Eyelash Curler. I don't have to explain, do I? And that's that. I am on the hunt for just a couple more things though. First, a daytime moisturizer with SPF15 or higher, OR a good face primer with SPF15 or higher. And then I also need an undereye concealer. Oh, and setting powder. Any recommendations?